Non fiction – paperback; Vintage; 293 pages; 2005 edition. 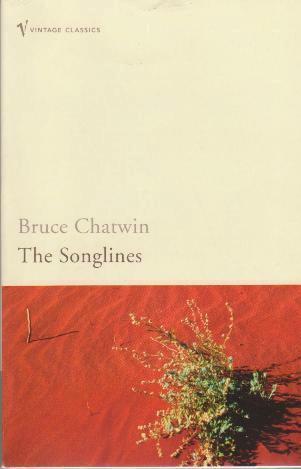 In the late 1980s, travel writer Bruce Chatwin visited the Australian outback to find out more about the songlines, the invisible pathways across the continent which connect communities and follow ancient boundaries. During his journey, he is accompanied by a Russian-born Australian, Arkady Volchok, who is mapping the sacred sites of the aborigines. Volchok proves to be a wonderful and knowledgeable host, showing Chatwin the rugged beauty of the landscape and introducing him to its many native human inhabitants. Chatwin’s writing is deceptively simple but very engaging; he captures feelings and characters so aptly that it’s almost like you’re on the journey with him. I thoroughly enjoyed his adventure to Alice Springs and the far north, especially his encounters with Jim Hanlon, a 73-year-old loner who wanted Chatwin to stay in a caravan “smelling of something dead” to finish his book, and Donkey Donk, an aboriginal who takes him hunting in a Ford Sedan which degenerates into a bit of a sad, hit-and-miss affair. My only quibble is that the book begins to wane about two-thirds of the way in and never quite picks up the pace again. Chatwin fills much of the last few chapters with jottings from old notebooks in an attempt to explore his idea that travelling is a natural instinct in humankind that has been tamed by the trappings of materialistic life. I appreciated the point, but felt it had been laboured much too strongly. Despite this, The Songlines is a highly readable and interesting travel tale, well worth reading, especially if you are interested in nomadic lifestyles, aboriginal culture and the Australian outback.